In my every jeepney ride, I do not neglect to wear my sunglasses. 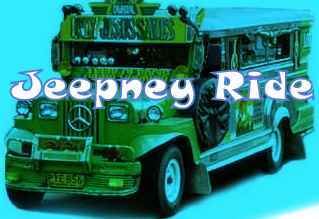 Jeepney is an open type of vehicle wherein the outside wind gets inside the jeepney. It could blow away your hair and could sometimes make your eyes sore because of the dust and dirt carried by the wind. It is important for a passenger to wear sunglasses not only as an accessory but as a protector as well. It will protect your eyes from the dirt as well as from the brightness of the sun. I always make sure that where ever I go I have my protector from the eyes. I am grateful that in my recent visit to an eye doctor, the results showed that my vision is still normal and eyeglasses with high grades is not yet recommended. The eye doctor only suggests that if I really want to protect my eyes from the radiation of computer, I could buy a specific eyeglass just for that. It was long before then that I was really planning to buy that kind of eyeglasses. My brother encouraged me to buy like the one he was for it would really protect your eyes from long exposure to the radiation emitted by computers. Thankfully, there are a lot of different styles of glasses for women in the eye clinic where I went. After choosing the frames for the glasses and waiting for two hours for them to fix it, I instantly use it. Now I have another eye protector. I was so exhausted by a heavy traffic caused by an election rally. It is already campaign period and I could not believe it that they held their rally in an intersection of a busy street. They really block the way that it caused a heavy traffic. My supposed to be forty-five minute jeepney ride became two hours. My co-passengers were already exhausted, hungry, angry, sweating and others almost fainted. Due to the severe traffic experienced by the commuters, other passengers who where also voters in this coming election sweared not to vote those candidates who held their election rally there. Too bad for them but they should really be considerate to those affected by the election rally they held. They should think for a more strategic location where they could held their election rally wherein there would be no effects like that. I just really hope it would not happen again.